A leading Kurdish politician has been jailed for making and "spreading terrorist propaganda" for militants fighting the Turkish state. 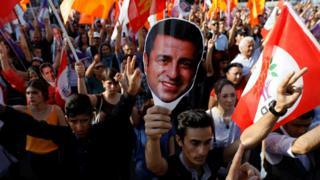 Selahattin Demirtas, a former co-chair of the pro-Kurdish Peoples' Democratic Party (HDP), will serve four years and eight months in jail, state media say. He came third in June's presidential election while behind bars, where he has been since his arrest in 2016. He denied all charges and human rights groups say the trial was political. A Turkish court also sentenced former HDP lawmaker Sirri Sureyya Onder to three years and six months on the same charge, CNN Turk reports. Demirtas faces dozens of charges for which he risks up to 142 years in jail if found guilty. The former presidential candidate is charged, along with other MPs, of links to the outlawed Kurdistan Workers' Party (PKK). 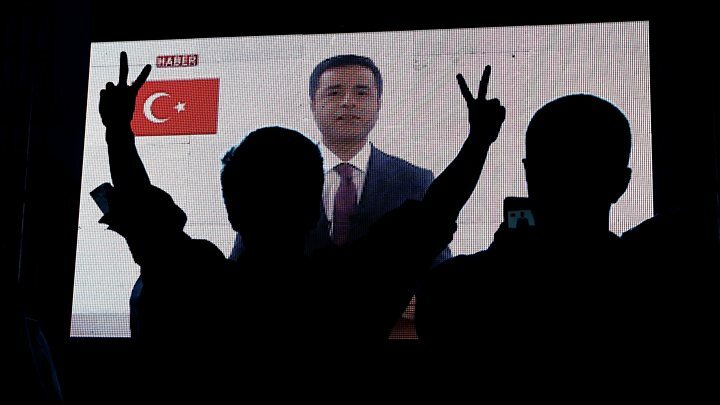 Prosecutors accused the two former HDP MPs of praising the banned PKK and its imprisoned leader Abdullah Ocalan in speeches made at a Kurdish Newroz celebration in 2013. Demirtas said in his defence on that he had made the speech during "the days when the most important steps were being taken regarding the Kurdish peace process" and added: "We made an effort for peace." After the court's ruling, he remained defiant in a message shared by his party on Twitter: "We will not take a step back, we will continue to defend peace." Onder, meanwhile, denied having uttered the remarks attributed to him in the indictment. Militants have been fighting for years to achieve independence for the Kurds, Turkey's biggest ethnic minority. The HDP had played a major role in the peace process between the PKK and the Turkish government, which started in 2013 and failed in 2015. Turkey accuses the HDP, the second main opposition party, of being the political wing of the PKK, which it denies. It became the first pro-Kurdish party to enter parliament in June 2015 with 67 MPs. The PKK is blacklisted as a terror organisation by Turkey and its Western allies, and there have been several military operations against them since 2015.